Those perennial rivals, love and ambition, clash anew as a hairdresser and would-be reporter struggles to earn a full-time berth on the Lehigh News-Times. Waiting between the red satin sheets of the Passion Peak Resort for gorgeous Associated Press photographer Steve Stiletto to satisfy the desires of her heart, among other organs, Bubbles Yablonsky (Bubbles in Trouble, 2002, etc.) gets a fax; her editor wants her to cover a breaking story at McMullen Coal’s Number Nine mine. Hightailing it to Slagville, she finds her cousin Carl “Stinky” Koolball’s Lexus parked outside Number Nine and a very dead car-dealer named Bud Price parked inside, along with a live but slightly dented Stiletto. The sweethearts narrowly escape a cave-in intended to send both their names to the obit desk, then rush off in opposite directions (after all, they work for rival news agencies). Stiletto roars off with ex-model Esmeralda Greene, AP’s rising star. Bubbles trots down to Main Street where her cousin Roxanne—the now-AWOL Stinky’s wife—runs a salon out of her living room. Joined by her leather-clad mother LuLu and mom’s survivalist sidekick Genevieve, Bubbles ventures into Limbo, where conspiracy theorist Pete Zudakis lives atop a still-burning underground coal fire; where Price had hoped to build a casino; and where she finds a secret darker than coal, scarier than her mother’s latest hairdo, and sure to require a skin-of-her-hot-pants rescue. 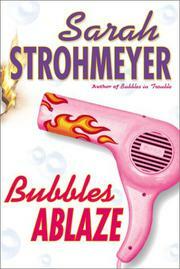 Better-than-usual mystery beneath the manic-as-usual Strohmeyer mayhem.